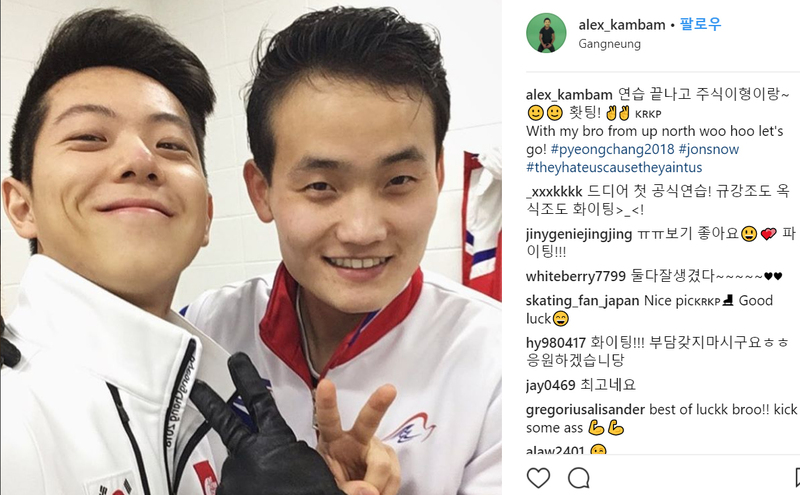 Korean figure skater Gam Gang-chan, who is competing in Pairs at PyeongChang 2018 Winter Olympics, uploaded a picture with a fellow skater from North Korea. Gam took the picture on February 4 after the practice with the Kim Joo-sik-Ryom Tae-ok team, as well as his partner Kim Gyu-eun. Two male figure skaters met each other in 2017 when they were trained by the same coach in Montreal. The two promised each other to practice hard to meet at PyeongChang Olympics.